Access information about the corresponding PartonBin object. Return a pointer to the PartonBin this instance refer to. Return pointers to the bins this instance refer to in case more than one parton has been extracted. Return a pointer to the data object of the incoming particle. Return a pointer to the data object of the extracted parton. In the case the incoming particle in turn is extracted from another particle, return the PartonBinInstance for that extraction. Return the parton bin instance corresponding to the first incoming particle for this bin. The PDFBase object describing the momentum distribution of the parton within the particle in this PartonBin. The remnant handler associated with the pdf(). Return true if the corresponding PDFs has a pole at $x=1$ for the current particle/parton combination. Functions used for the generation. Reset the current PartonBin, making room for a new event. Reset last generated l and Q2 values of this and parent bins. Generate l and Q2 of this and parent bins. Get the jacobian associated with the phase space point generated. Set the jacobian associated with the phase space point generated. Access information about the generated extraction. Get the current particle instance. Set the current particle instance. Get the current parton instance. Set the current parton instance. The currently extracted partons (in case of multiple interactions. Get the scale at which the current parton was extracted. Set the scale at which the current parton was extracted. Return the transverse momentum of the extracted parton. Get the weight associated with the remnant generation. Set the weight associated with the remnant generation. Pointer to the main bin this instance refer to. Pointer to the main bin (and secondary in case several partons have been extracted this instance refer to. In the case the incoming particle in turn is extracted from another particle, this is the PartonBinInstance for that extraction. The jacobian associated with the phase space point generated. The scale at which the current parton was extracted. The transverse momentum of the extracted parton. The weight associated with the remnant generation. 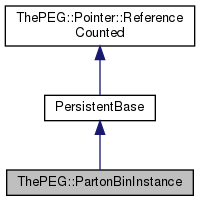 PartonBinInstance is used to store information about the generation of a given parton extraction for a corresponding PartonBin object. Definition at line 28 of file PartonBinInstance.h. Constructor taking a PartonBin as argument. The second argument should be used if the incoming bin is already known and exists. Constructor using an already prepared extracted parton. This will also initialize the x, and scale values. To calculate the momentum fractions, a Direction<0> object must have been properly initialized. parton the extracted parton which must have its first parent set to define the particle extracted from. pb the PartonBin object corresponding to the extracted parton. If the particle extracted from in turn has been extracted, the incoming() member of the PartonBin must point to the corresponding PartonBin. scale the resolution scale at which the parton was extracted. Constructor using a parton which is to be extracted from the given particle, but no mother-child relations exist, yet. Get one minus the momentum fraction of this parton w.r.t. the incoming particle in this bin. Definition at line 212 of file PartonBinInstance.h. References ThePEG::Math::exp1m(), li(), and theEps. Get the logarithmic momentum fraction of this parton w.r.t. Definition at line 247 of file PartonBinInstance.h. Set the logarithmic momentum fraction of this parton w.r.t. Definition at line 253 of file PartonBinInstance.h. Definition at line 221 of file PartonBinInstance.h. Referenced by eps(), and xi(). Definition at line 227 of file PartonBinInstance.h. References theEps, theLi, and theXi. Get information saved by the remnant handler from the generation, to be used in the construction of the remnants. Definition at line 300 of file PartonBinInstance.h. Set information saved by the remnant handler from the generation, to be used in the construction of the remnants. Definition at line 307 of file PartonBinInstance.h. References Init(), persistentInput(), persistentOutput(), and theRemInfo. Get the momentum fraction of this parton w.r.t. Definition at line 237 of file PartonBinInstance.h. Definition at line 202 of file PartonBinInstance.h. The momentum fraction (xi, li=log(xi), eps=1-xi), of this parton w.r.t. Definition at line 385 of file PartonBinInstance.h. Referenced by eps(), and li(). The momentum fraction (x, l=log(x)) of this parton w.r.t. Definition at line 402 of file PartonBinInstance.h. Definition at line 391 of file PartonBinInstance.h. The information saved by the remnant handler from the generation, to be used in the construction of the remnants. Definition at line 429 of file PartonBinInstance.h. Definition at line 397 of file PartonBinInstance.h. Referenced by l(), and x(). Definition at line 379 of file PartonBinInstance.h. Referenced by li(), and xi().